Ah, the age old question – how will I fit my entire wardrobe into a small duffle bag? It's a question we've all come across when flying interstate for a long weekend. I'm the first to admit I'm a horrible packer. My boyfriend refuses to be around me when I'm packing because 1. it takes far too long in his eyes, and 2. he doesn't like seeing me distressed. Yes, distressed. I'm not sure how it happens, but one thing leads to another and I'm sitting in a pile of my clothes swearing at the mess I've made. That being said, I am getting better. Practice makes perfect, right? Well, tomorrow I fly across what they call an ocean to little ol' Tasmania for a mini-getaway. I haven't been on a proper, outside of the state of Victoria holiday in, well, if I can't remember when, it's obviously been far too long! Now, for those of you who don't know, Tasmania is at the very bottom of Australia, and it get COLD! Arctic even! So, I've got to fit everything that will keep little ol' me warm in arctic conditions. With the sub-climate temperatures in mind, and a 7kg carry-on luggage restriction, here's a little guide for you, and me, when packing for winter. The best place to get started is the pieces that build the outfits. I'm sticking to classic pieces because it means each item will go with the other. When you think winter classics you think, warm woollen knits, black skinny jeans, Chelsea ankle boots, and trench coats (although I have to admit, I'm more of a fan of the duffle). Maybe the most important thing you're to pack when going away is shoes. In all seriousness, I find they are the one thing that constitutes a good vs. bad trip. So, for the love of all walking distance attractions, pack comfortable shoes! I usually stick to my trust Vans, and flat ankle boots. This is probably an obvious one, but it's a great idea to check what kind of weather you're in for. And even then, the weather man is usually wrong from time-to-time, so pack expecting the unexpected. And do not, I repeat, do not, forget your umbrella! Winter is a harsh climate for skin, and my skin tends to hinder on dry over oily. However, I don't want to overpack my cosmetics! These bottles easily spill and cause troubles so I want to stick to the very basics, and products I know and love. Now, let's face it, it's going to be cold. Colder than you ever thought, because you won't be spending time indoors. You'll be out making the most of it! As uncool as it is, pack a thermal top, these are ridiculously helpful. I also like to pack extra stockings to wear under my jeans when it's really cold. Jeans seems to absorb the cold, and there's no escaping frozen legs! There's quite a lot of standing around when playing the role of a tourist. So don't forget to pack your camera, a good book to read, and your music/headphones. 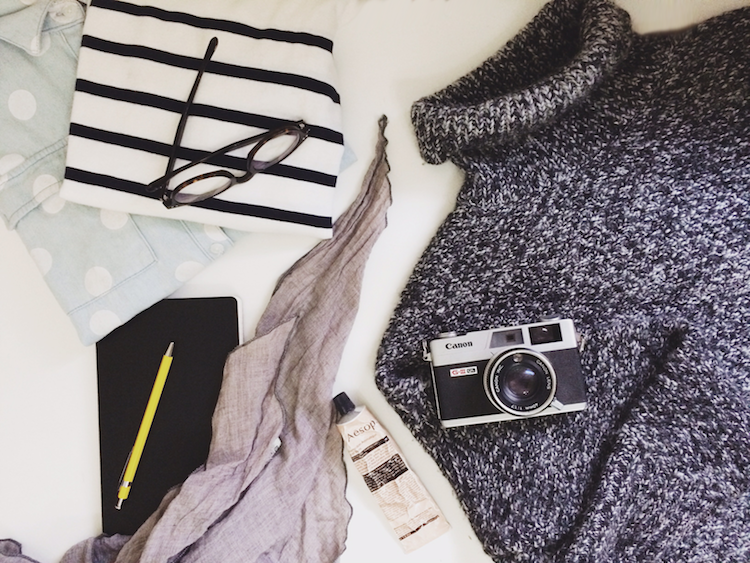 These items, at the end of the day, are your travel companions. And last but not least, here is my four day winter holiday packing list. 1 x winter coat 1 x pair of black jeans 2 x button up shirts 1 x stripped long-sleeve top 3 x woollen knits 1 x thermal top 1 x winter dress 1 x pair of PJs 2 x lightweight but chunky scarves 1 x black ankle boots 1 x sneakers Don't forget the undies and socks! I also like to take stockings, these are good for wearing under jeans when it's particularly cold! Now that's done, I can get back to finishing season 4 of Game of Thrones... #nospoilers!